Police say more than 60,000 demonstrators protested in Santiago, CNN Chile reported. (CNN) -- Vehicles burned and tear gas flew in Chile's capital Tuesday as tens of thousands of demonstrators protested education policies in the South American nation. 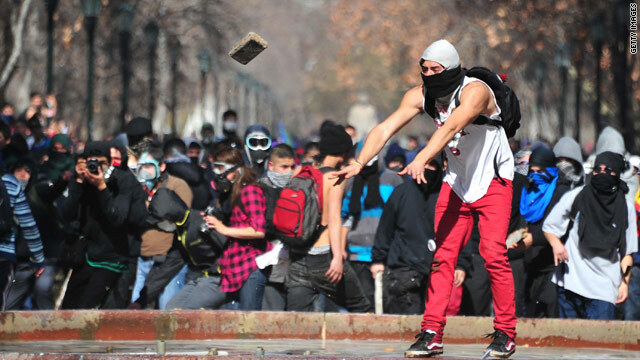 Police said more than 60,000 demonstrators protested in Santiago, CNN Chile reported. The march in Chile's capital began peacefully but became violent, CNN's sister network reported, with some protesters setting vehicles ablaze and throwing debris at police. Video from CNN Chile showed authorities shooting tear gas into crowds of demonstrators. The nationwide marches were the latest in a series of protests that began weeks ago. Students have been demanding lower tuition and other reforms in the nation's education system. Protesters Tuesday included students, professors and copper workers -- who announced a strike to support the student movement. Tuesday's marches came after police arrested nearly 900 protesters last week, accusing them of blocking roads and disturbing the peace as they participated in unauthorized marches. Details were not immediately available about arrests in Tuesday's march -- which officials authorized. "Unfortunately, the results have shown one more time that they (organizers) do not have control of the marches," Chilean Interior Minister Rodrigo Hinzpeter told reporters. But student leader Pedro Pablo Glatz told CNN en Español that only a small group of an estimated 100,000 protesters who marched nationwide Tuesday had turned to violence. And the disturbances have repeatedly been condemned by the movement's organizers, he said. "We have been marching all along in a massive, peaceful manner," he said. Last month Chilean President Sebastian Pinera announced a new plan that included a $4 billion education fund, but his proposal has done little to mollify protesters, who say the government must do more to guarantee students' right to an affordable education. Hinzpeter repeated the government's calls to end protests and negotiate details of education reforms in other settings, such as in the halls of Chile's National Congress. "It is time to start work of substance," he said. CNN en Español Guillermo Arduino contributed to this report.